Around the globe, people are searching for ways to reduce plastic waste. 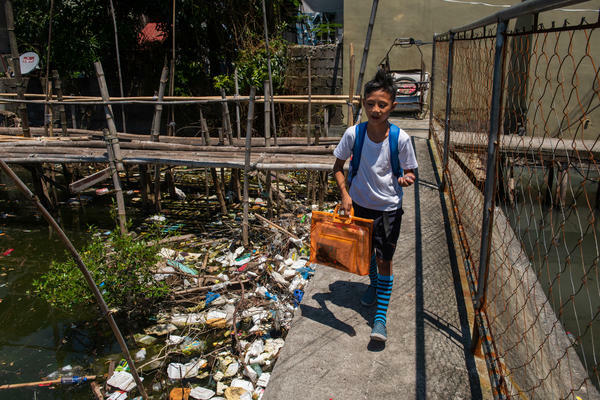 Above: Dampalit, a fishing community in Manila Bay, can't keep up with a constant influx of trash. Grate argues that the corporations that produce the waste should be responsible for cleaning it up. And one way he's getting the brands' attention is by naming and shaming the companies. We asked readers to share their questions about plastic waste. Nearly 300 questions were submitted, on topics ranging from microplastics in the ocean to how to help the activist in the story. Here are some of the most frequently asked questions, answered by NPR correspondent Christopher Joyce and producer Rebecca Davis, who reported the story. How can I find out if the plastic I put into recycling in my community is really being recycled and not just sent to some poor country? Most of the plastic sent overseas has been sent to China, where it is recycled to make other plastic products. But China has stopped taking the world's recyclable plastic. As a result, a lot is piling up here in the U.S. The U.S. recycling industry has relied on the Chinese and now can't handle all the waste, so a lot of it is ending up in landfills. There is anecdotal evidence that some waste is going to other Asian countries for recycling, but some countries, like Malaysia, now say they don't want it, either. United Nations documents show that worldwide exports and imports of plastic for recycling are decreasing in many places. In any case, my understanding is that a lot more plastic generated here is mostly staying here, for the moment. Aren't there biodegradable plastics that can be used for packaging and if so, why aren't they? There are lots of research efforts underway, from big companies like Unilever to university and private industry labs where scientists are looking for alternatives. Some substitutes are made from petrochemicals like waste methane from sewage treatment plants. Some are from biological raw materials, like algae. It's a big hurdle though. There is "industrial" biodegradable, which means the waste plastic has to be treated with chemicals or heat to degrade — expensive and time-consuming with potentially bad byproducts. But the ideal is something that will biodegrade fast in a natural environment, and it shouldn't leave nasty stuff in the environment once it degrades. At the same time it has to be durable if you use it for packaging, so it's hard to get both in one product that also doesn't cost a lot. How can I, a high schooler in small-town Wisconsin, help reduce plastic waste both locally and globally? There are so many ways to attack this problem. Some people work on straws, some on plastic bags. Start making changes in your own life. Use Mason jars for drinks and soups and salad for your lunch; instead of plastic wrap use reuseable beeswax wrappers or wax paper (which is paper, not plastic, and will eventually biodegrade). Set a good example by thinking of creative ways you can get around using plastic in your own life and then talk about it. A school group in my community called the Young Activist Club convinced the school board to stop using lunch trays made of polystrene, which is not usually recycled, and switch to cardboard instead. Are there people in the U.S. that are plastic shaming like Froilan Grate? Some environmental organizations like Greenpeace are following what the Philippines' groups started: brand audits in which they collect plastic trash from beaches or communities and publish the brand logos and names on the web. Others in the U.S. have begun to do so but have not yet published the results, in part because they want to inform the brands about what's out there and how much of it belongs to which brands, and then use that information to negotiate with them to find substitute packaging or help local communities collect and recycle the trash. The view of some environmental groups is that many of the brands want to improve the situation and that public shaming may not be necessary. One of the things that activists are pushing is called "extended producer responsibility." What makes some plastics recyclable and others not? Lots of reasons. Things like sachets (the ketchup package in the fast food restaurant and the ubiquitous packaging used by brands that contain one day's worth of soap or snacks in Asia) are made of plastic but also have a lining of aluminum or some other metallic material; or it's plastic and paper combined; or some plastic has additives for color or durability. These are generally not recyclable, at least not without expensive technology that is not widely available, because they're made of mixed materials. Also, plastic items that are contaminated with oil or food are often weeded out of recycling centers and end up in landfills. Thin film plastic bags — like the bags newspapers are wrapped in — are not recyclable in most recycling centers because they are too thin and gum up the machinery. They can be recycled but in a separate process. What happened to the building blocks for housing, walls, sidewalks, etc. that were to be made from our ocean plastic? Lots of plastic, especially plastic that can't easily be recycled into plastic pellets to make more plastic, is converted to things like building materials. That doesn't help with ocean plastic waste because there's no practical way to collect it from the ocean. One recent attempt failed badly (as predicted by oceanographers). What can I do to aid the activist in this story? Thank you to everyone who participated in our callout. More questions and answers can be found in the Reddit AMA on plastic waste that Christopher Joyce and Rebecca Davis did in January. Our plastics series, The Plastic Tide, will continue throughout 2019. Check out this page for the latest stories.